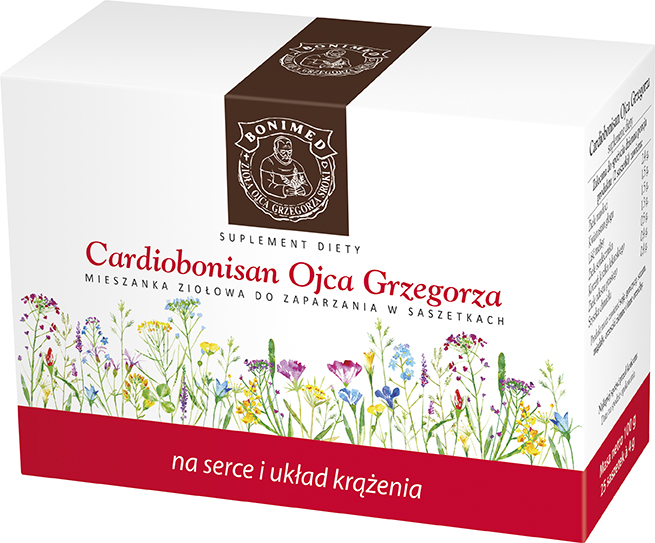 Because the product contains hawthorn inflorescence, it supports a healthy heart muscle and blood supply to the heart muscle, as well as it helps maintain a stable blood pressure. Because it contains goldenrod and common knotgrass herbs, the product helps urinate, and maintains the health of the urinary tract. Because it contains melissa leaf, valerian root, hop cones, hawthorn inflorescence, and motherwort, Cardiobonisan relieves stress and helps you fall asleep. Ingredients: Goldenrod herb 30%, hawthorn inflorescence 18.75%, melissa leaf 18.75%, motherwort herb 16.25%, valerian root 6.25%, common knotgrass herb 5%, hop cones 5%. How to use: We recommend using 2 sachets per day. Take 1 sachet by mouth 2 times per day (make an infusion). Recommended daily intake of the product (2 sachets) contains : Goldenrod herb 2.4 g, hawthorn inflorescence 1.5 g, melissa leaf 1.5 g, motherwort herb 1.3 g, valerian root 0.5 g, common knotgrass herb 0.4 g, hop cones 0.4 g.
Storage: Store in a closed package in temperature lower than 25°C, in a dry place. Protect from sunlight. Keep out of reach of children. Dietary supplements should not be treated as a substitute (replacement) of a varied diet. Do not exceed recommended daily intake during the day. Don’t use it if you are allergic to the product ingredients. If you are pregnant or breastfeeding, or if you want to give the product to children younger than 12 years old, talk to your doctor or pharmacist first. The product may affect your ability to drive and use machines. It may slow your reaction time. We recommend exercising special caution and waiting at least 2 hours before driving.